Walter Kuehr is gone, but his dream lives on. The colorful musician and entrepreneur, who owned the Main Squeeze accordion shop on Essex Street until his death on Jan. 2, will be feted on Monday, fittingly enough, with an accordion-centric concert. He was 59 years old and had battled lymphoma for several years. But, known for his outsize personality, he turned even that into the source of a fanciful story. Mr. Kuehr joked that the scar on his neck was from a knife fight he had in Argentina, not due to his illness. His cozy store, shuttered since its lease expired on Jan. 15, was crammed with every kind of squeezebox, accordion-themed tchotchkes and the motorcycle he often parked inside. The shop became a clubhouse for performers and accordion enthusiasts after the German immigrant opened it in 1996. He founded bands like the Last of the International Playboys, which fused Latin styles with jazz, and the Main Squeeze Orchestra, an all-female accordion ensemble inspired by a dream he had in 2002. “He had many dreams and he didn’t ever think that they wouldn’t come true,” said Sarah Starpoli, one of the orchestra’s 14 members. On Monday, the group presents a celebration of its friend and mentor at (Le) Poisson Rouge in Greenwich Village. They join a roster including the Playboys, bandoneon player J.P. Jofre and the New Tango Quintet and Joe Hurley and the Gents. Ms. Starpoli enlisted in the ensemble, which Mr. Kuehr conducted, shortly after moving to New York from San Francisco in 2006. Around 40 women have passed through the band’s ranks in the past dozen years. Mr. Kuehr’s charms didn’t only work on women, though. 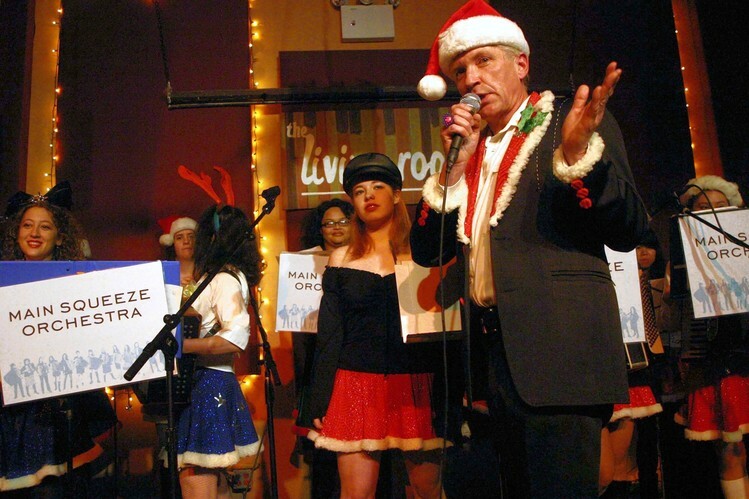 “I quit a job as a record-company lawyer to sing in Walter’s band,” said Mark Palermo, who befriended Mr. Kuehr soon after the Main Squeeze shop opened. He was the vocalist for the Last of the International Playboys for a few years during its genre-blurring heyday. “We were kind of a Swiss Army knife band,” he said. Mr. Palermo, who rejoins the Playboys Monday, applauded his friend’s sense of timing. “The accordion had broken wide as a newly hip instrument,” he said. Mr. Kuehr also was influential in promoting the instrument’s popularity. Acts such as “Weird Al” Yankovic and They Might Be Giants were customers, and he taught hundreds of students over the years. He also made and sold his own Main Squeeze-brand accordions. “They had a lot of features packed into a little space,” said Mr. Palermo. Rachel Swaner, a founding member of the Main Squeeze Orchestra, expects the concert to be full of wild anecdotes, in the spirit of Mr. Kuehr.